Omi is 14 years old and is one hundred percent vegetarian. Despite his meatless diet, he measures 1.84 meters, his shoe size is 45, and he plays all sports that involve chasing a ball at least six times a week. After all these years, we finally have living proof that being raised vegetarian works. It’s true. It’s not just a theory. You can be a vegetarian kid and also be healthy, tall, and physically fit. For those 32 years since I’ve stopped eating meat, and the 14 years that Omi hasn’t eaten meat, it has been the main topic of conversation at almost every big Chinese family reunion meal, of which we have about ten annually. Now that Omi has grown so tall, all I have to do is point to his size… I don’t even need to explain for the millionth time. It’s painful, trust me, when a meat dish arrives on the table, and the whole topic starts over again. Beijing people’s favorite pastime is to talk food and politics. Unlike his mom who grew up most of her childhood as a third culture child, including in Beijing, Omi is a triple culture native child. He’s a mix of French, Indian, and Beijing cultures. Omi has been vegetarian since his conception. His Beijing-raised, meat-loving, Buddhist dad and I agreed early on that since I only eat fish on occasion, and I don’t buy, touch or prepare meat, even for others, Omi and his older sister would grow up meatless until they consciously decided otherwise. When you leave it up to a child, the pressure is high on all sides, and the peer pressure at school can be particularly strong. In fact, my now 18-year-old daughter was talked into eating meat when she was in the third grade. There were also the pressures of wanting to fit in, being shy, our Chinese family, and finally lack of support from her community. I didn’t pay enough attention. I was too polite. I had written to the school to explain, as I have every year during both kids’ schooling for the last 14 years, that she was vegetarian, though it was not taken seriously. So I was extra careful with my second child. I started writing more and more impassioned letters to his school. I visited the cafeteria and met the chefs. I was once told that if my son were Muslim, he could benefit from a special Halal meal alternative. The following year, my Moroccan chef friend who was managing the cafeteria took it upon himself to make sure my son was fed some type of non-meat protein. I still had to make sure Omi would not forget to go to the back kitchen and ask for his egg every day. “Just white rice?” I politely thanked him but I was fuming inside. So, he wanted to feed a boy going into puberty, competing in soccer for the school, white rice and salad; that’s basically sugar and water with traces of minerals. So in my last letter to the school administration, I went all out. I emphasized that it’s not fair that kids with allergies or religious beliefs are respected, but vegetarians are not. Should we claim to be Hindu? Would his vegetarian choice be respected then? Without lying, I could claim to be Hindu, but it wouldn’t be intellectually honest as we consider it a philosophy, not a religion. I presented statistics regarding the percentage of the French population who are vegetarian. I even sent the letter to the parent association. I was told that they take this matter very seriously, but nothing came out of it. Omi wasn’t even allowed to bring his own food to school as this was explained to be not up to their hygienic standards. It is important to give constructive suggestions as I did in my letters to the school. Most people have no idea what plant-based protein is, so I listed recipe ideas that would benefit all kids. Many schools have actually adopted “Meatless Mondays”, and other such challenges to help our children understand and start cutting back on meat-focused diets. These are not sustainable and we know it. The industrial meat industry exists because of our overconsumption of meat, and reducing our meat intake will reduce the effects of climate change. Why are we thinking about this? For future generations. So I suggested to the school cafeteria to prepare lentils or quinoa in a tomato sauce, whole grain pasta with fresh pesto, whole grains with doufu, or any of a million other combinations of veggies and whole grains. Every child at the school would have benefited from such healthy food! It should, in fact, be the basis of any diet. It must be obvious that I believe in this quite strongly, and even after all the external pressure to eat meat, Omi is now almost vegan totally of his own accord. His sister cooks her own food in her dorm at university, which involves whole grains and fresh veggies, and she rarely eats meat. Equally passionate (albeit on the opposing end of the spectrum) is my loving, doting Beijing mother-in-law, who believes in feeding her only grandson his daily dose of meat. She feels it is just not conceivable, even irresponsible, to allow a child to grow up without eating meat. I’ve heard it so many times that I even started doubting my own beliefs. After all, I only stopped eating meat when I turned 16, so I wasn’t one hundred percent sure. As a parent, you can not take your child’s health and make an experiment of it. So, I decided to get some scientific proof, and went to get a blood test for Omi. He was deficient in only one thing, vitamin D, explained the doctor. This was due to lack of sunlight, likely from living in Beijing. Omi gets annoyed. Even his dad, a firm believer in meat for muscles, tries to defend him. We have since discovered the winning argument. The greatest male athletes, like Michael Phelps, Carl Lewis, Edwin Moses and Mike Tyson are all vegetarian. Yes. Mike Tyson! I can hear them in my head all sadly protest the idea of Mike Tyson being a vegetarian. “Mike Tyson? Vegetarian? Not possible!” But yes, Mike Tyson. Vegetarian. Check. 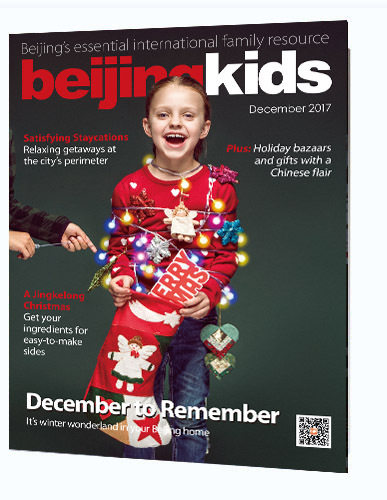 This article appeared on p30-31 of beijingkids December 2017 issue.